We Are Fully Stocked With Full Winter Wetsuits, Summer Wetsuits and Shorties. As the UK’s largest dedicated surf hire we committed to hiring out quality equipment. All of our team are surfers who help field test and hand pick our selection of wetsuits, ensuring you have access to the best equipment available throughout the year. We measure our wetsuits with you to make sure you have the appropriate size. Whatever the weather, we’ve got you covered! We hire winter wetsuits, wetsuit boots, gloves and hoods, along with thermal and hooded rash vests. How well a wetsuit works is completely affected by its construction. This means the neoprene that is being used and how the wetsuit has been put together. Our wetsuits are all glued, blind stitched and taped at the seams. The quality of this construction means water only comes in at the ankles, neck and waist area. With a good fit, this is minimal. 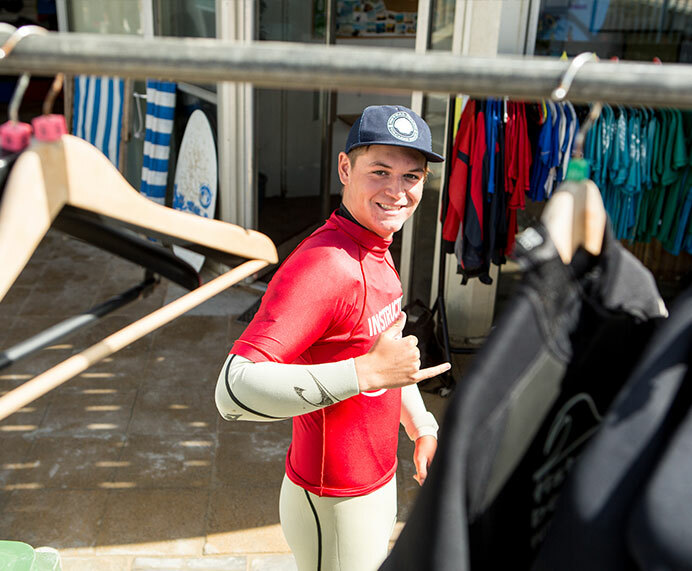 We stock these wetsuits all year round so you can be confident that you will always be well equipped to enjoy your surfing experience in Newquay. During the warmer months we also have a large range of shorty and Funky Seal (patterned) wetsuits available. Coming on a cooler day? Take a look at the different wetsuit accessories we have available throughout the year.